Many first-time dog owners get excited when they bring their first pup home, but do you think they know that challenges come with their new best friend? For instance, if you’re a new dog owner, or if you’re bringing another pup home in addition to the ones you already have, did you consider the aggravation that will come along with “potty training” your pup? Have you thought about whether you want him or her to be pee pad trained or if you want him or her to go outside to eliminate? In the beginning days and weeks, your new puppy may want to mark his or her territory in the house, as this will make the home feel more like theirs. In solving that problem, you’ll need some advice. So, while “potty training” the new doggo, have you considered using a homemade dog urine repellent as your backup method to cleaning the messes he or she is bound to make? Either way, if your dog training is not going as you’ve planned, try targeting those problem areas by creating a natural dog repellent. These home remedies will have you using cayenne pepper, citrus oil, baking soda, lemon juice, pepper spray, and distilled white vinegar for carpet, for furniture, and for lawns. You’ll have the opportunity to get your house smelling like a new home, with no dog urine odors. Commercial sprays are accessible, but why use them when you can create a homemade dog deterrent spray that works just as well for half the price? Using this recipe will deter your dog from marking its territory in the areas that you spray it since they will not like the smell of the solution. Mix all ingredients and pour into a clean, small spray bottle. Spray the solution onto any areas where you do not want your dog to eliminate. For furniture, be careful where you spray, as the odor can be intense. Try a small section of the furniture before spraying it entirely. Keeping dogs from eliminating on the furniture and in the flower beds is typically difficult, but that’s why you need to find the right combination of ingredients to put in a clean spray bottle. Then, you’ll be able to start spraying the areas you want your dog to avoid. No need for a recipe for this one; mix one part cayenne pepper with ten parts water and spray the mixture over the areas you wish to keep your dog away. Be careful not to add too much cayenne pepper as this could hurt your dog’s sensitive nose. If you’re trying to make sure your dog doesn’t eliminate in the house, put a few drops of eucalyptus, cinnamon, or sour apple essential oil around the area. Mix the solution with water first, as the solution itself may be too potent for you and your dog’s nose. Dogs hate the smell of essential oils, but they hate the smell of vinegar even more; it’s nature’s miracle! If you’re trying to get rid of that dog urine smell, soak some cotton balls in vinegar and place them in areas you’d like your dog to avoid. If you’d like the scent to be more pleasing to your sense of smell, mix lemon juice with vinegar and spray it around problem areas. You can also take a glass of lemon water and mix it with vinegar for a similar effect. Be sure not to spray vinegar on plants, as it will kill them. There’s no mixing needed for this urine repellent. Spread the oil in areas where you’d like your dog to stay away. He or she won’t be eliminating anywhere near the stuff. Chili powder, or chili pepper, works wonders for keeping your dog(s) away from the household plants. If you don’t have these ingredients, hot pepper will likely have the same effect. Sprinkle some chili powder, chili peppers, or hot peppers around the plants, and your dog will stay away. Be aware; pepper spray works, just not as well as chili powder and peppers. The ammonia smell does a great job of keeping dogs away. This substance repels dogs more than any other element. Soak some cotton balls in the ammonia solution and put them in the problem areas around the house. The smell of alcohol repels dogs just as much as ammonia. Soak cotton balls and spread them in locations you’d like your dog to avoid. Yes, citrus scents will keep your dog away from certain areas. Grab your fruit of choice (orange, lemon, lime, etc.) and cut them up. Place the citrus fruit in and around plants to keep your dog from urinating on them. This solution is appropriate for indoor or outdoor plants. If you don’t want to waste the fruit, use the peel from the fruit as a deterrent. To protect your furniture from dog elimination, place a cup of lemon water on a higher surface near the couches and chairs you admire. Dogs may have issues with eliminating in a place where they should not be, but they also have problems with digging up the yard and the garden, and no one seems to tackle this topic often. If your dog is continuously digging up areas they shouldn’t, take some of their poop and place it around the problem areas. It’s likely that the pup won’t want to get down and dirty with its poop. If you’re a dog owner, you know and understand that removing dog urine smell from carpets is difficult. This is because the urine gets into the fiber of the carpet and the padding. Here is an effective enzymatic cleaner for carpet. Dab the area with mild dish soap. Mix vinegar and water and put the solution into a spray bottle. Spray the area lightly and repeat if needed. Once finished, sprinkle the area with baking soda and vacuum up the remains. 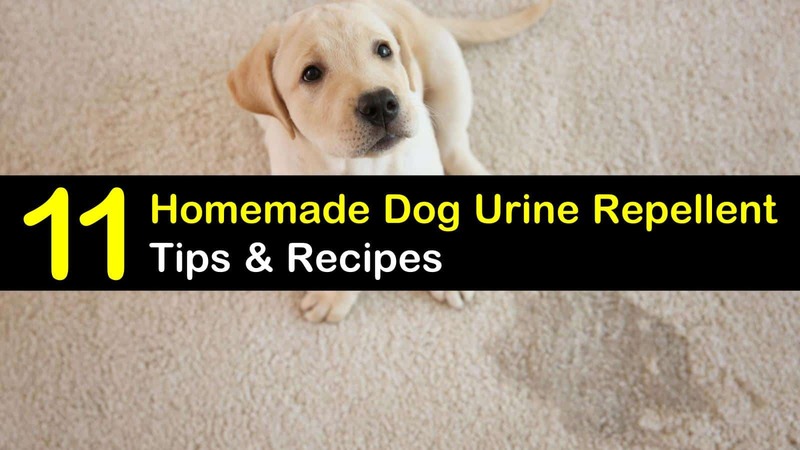 Here, you’ve learned about dog urine repellents and deterrents using simple ingredients. Most tips and tricks are unique ingredients, like essential oils and chili powder; and other options are recipe based. Pick and choose what best fits your scenario to stop your dog from eliminating in unwanted areas. 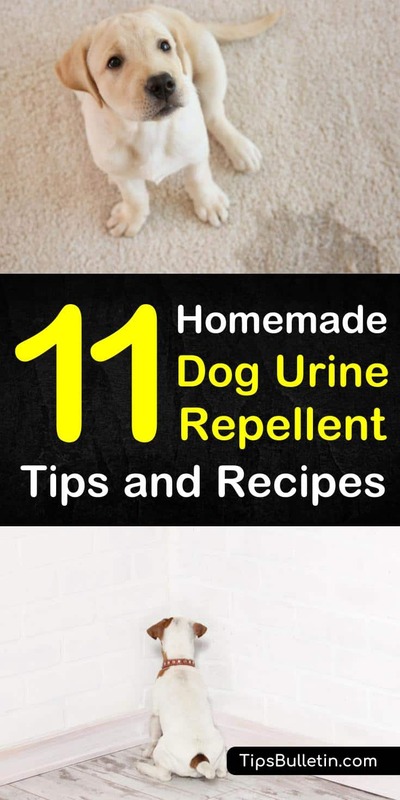 We hope you liked our homemade dog urine repellent tips and recipes for furniture, for carpet, and lawns. If you did, please share our natural dog repellent tricks on Facebook and Pinterest with your friends.